Acids and AHAs are miracle workers. I've spoken in depth about the benefits of AHA loads (see this post) so I won't go into too much detail. But they essentially dissolve the glue that holds dead cells together, causing them to shed and newer brighter, more refined skin is revealed. I love a good skincare acid. And ones that work overnight have a brilliant effect. I've tried quite a few but I've whittled down my favourites so here they are. This is acid is brilliant! 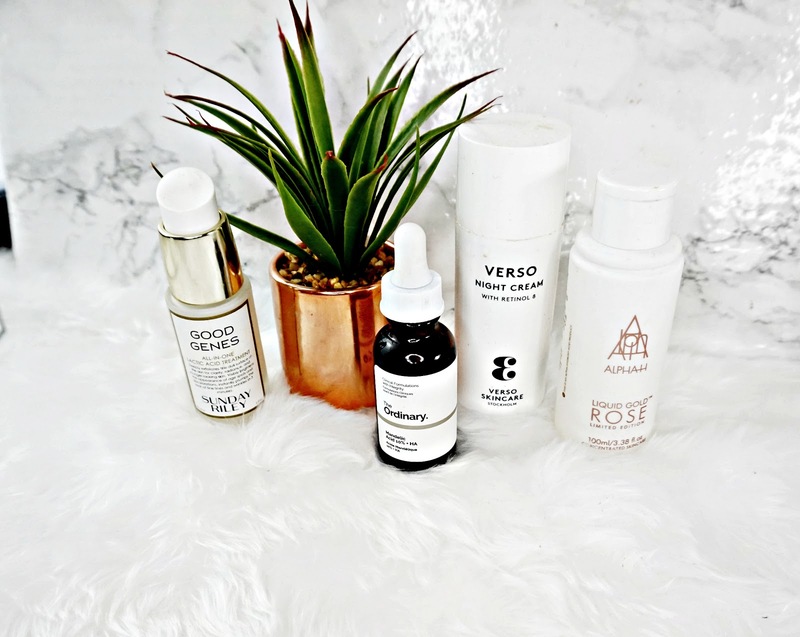 Mandelic acid works in a similar way to Gylocolic and Lactic acid but has much larger molecules so it doesn't penetrate the skin as deep, making this a great acid for those with sensitive skin. Even though this doesn't penetrate the skin as deep as other acids this still gave me brilliant results. My skin looks so much brighter when I use this and feels so much smoother to. Long term it can also help with fine lines and hyper pigmentation. It has a watery serum like consistency that dries on the skin almost instantly. I like to use this before any of my other skincare products. Salicylic acid is great for oily, blemish pore skin. So I like to reserve to treat any active breakouts. And boy does this work! I like to apply a drop or two directly onto the spot, leave it on over night and in the morning it looks significantly better. less Red and a lot smaller. It really helps to speed up the healing time. Unless you have oily skin I don't recommend using this over your entire face because it's quite drying but on a breakout this stuff is amazing! And so cheap. This multi tasking cream uses lactic acid, which I find has a super effect on my dehydrated skin. It smooths the skin, leaves it looking brighter and improves elasticity. This offering has more of a moisturiser consistency that can be used as a mask or overnight with other skincare. I like to use this overnight because I find it more effective. This does slightly tingle on application but it's not uncomfortable at all and it wears off pretty quickly. This is actually really hydrating. I like to use this 3-4 times and it really helped improve the overall look and feel of my skin. Now this stuff is like good skin in a bottle and the results are something else! It really leaves my skin so soft and smooth with a healthy glow to it. This overnight treatment comes in a toner form. It can be used overnight, alone or layered with other skincare but it doesn't have as intense results when used with other products. So I like to use it alone. This doesn't tingle or anything which is surprising because this has such amazing results. It also contains soothing ingredients to prevent the skin from being irritated by the Glycoloic acid. I actually find this quite hydrating to. Now this isn't a treatment like the other acids I've spoke about, it's a moisturiser that contains Retinol. Retinol really is a wonder ingredient when it comes to anti ageing (see this post) it's one of the only clinically proven ingredients to actually improve fine lines and winkles. And this Verso offering is one of the best i've tried. It's not irritating at all but it really packs a punch in terms of results. After just one use my skin looked so plump and smooth. I've been using this for a few months now and my skin has never looked so good! It's really given my skin a good healthy glow, kept my dehydration at bay whist improving pigmentation. Just a little disclaimer I don't use all these products at the same time. I only use one of them and the night cream at the same time. Over using Acids can have a negative effect on the skin. Just something to bare in mind.